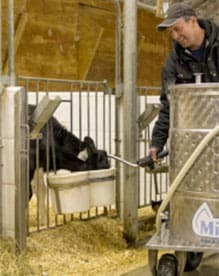 We had thought about purchasing a milk pasteurizer for our calves in the past, and so when we recently switched to a robotic milking system, the MilkTaxi was an easy choice as it integrated perfectly with the rest of our system. The MilkTaxi allows us to feed our calves more efficiently and precisely, and it is so easy to use, anybody can feed the calves without hassle. We would recommend the Milk Taxi to anyone, robotic milking system or not.